Who Let the Dogs Out? Not You With Your Best Dog Gates! To sustain this free service, we receive affiliate commissions via some of our links. This doesn’t affect rankings. Our review process. Is your dog getting into rooms she’s not supposed to be in? Maybe she’s stealing socks from the laundry room or destroying the downstairs area after you’ve cleaned it up. You’re not alone! I know of a dog that would sneak into the kitchen and eat an entire loaf of bread through the tiniest hole before his owners could get to him. Dogs can be sneaky, and it’s nearly impossible to keep your eyes on them at all times. That’s why retractable pet gates are a great idea for your home. 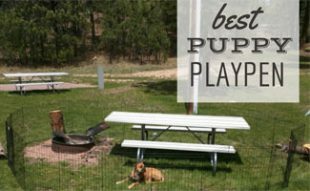 What Are The Best Dog Gates? It depends on your situation. 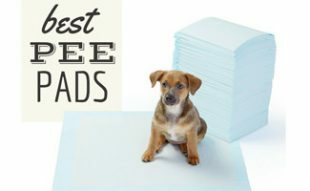 There are various types of pet gates, so depending on your dog and the rest of your family, you may find one to be a better fit than another. If you’re looking for dog gates for stairs, be sure to measure the opening appropriately. We will discuss four different types: indoor dog gates, pet gates with doors, extra tall pet gates and outdoor pet gates. There are many things to consider while deciding which gate to purchase. 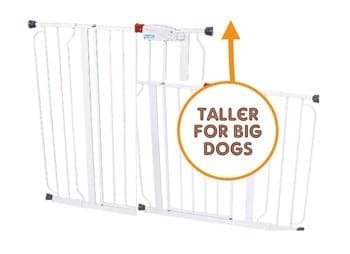 People with larger dogs will probably want extra tall dog gates. If you have a dog as well as a cat, you may want a pet gate with a smaller door for your cat to wander around as he pleases. You’ll also want to take into consideration the dimensions of the gate as well as if the gate is kid-friendly, which all of the gates in this article are. 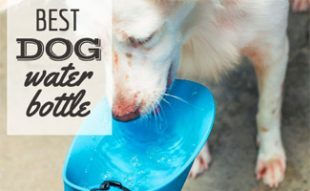 Read below to see which product we recommend for which pet. 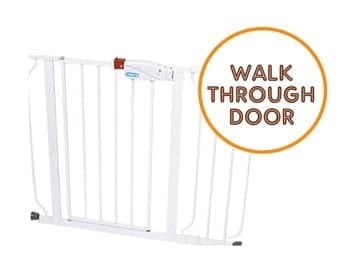 This gate is constructed of steel and is meant to keep children away from stairways or other rooms; however, many pet parents use them for their pets as well for dog gates indoor. It’s one of the best gates available, and people love it. If you decide to purchase it, please promise you’ll read the instructions. Promise?! 😉 This gate is a pressure mount gate and uses spring tension from the bottom rail to help it stay in place. This is explained more thoroughly in the instructions. When you receive the gate, you’ll notice it looks a bit warped, and the latch does not reach all the way. This is not a defect! It is meant to look this way, so you should not send it back. Read the instructions carefully to install it properly. Most people who have problems with this gate typically do not read the instructions correctly. 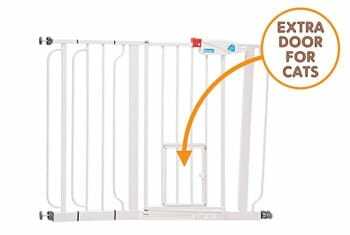 This expandable gate is perfect for all breeds and ages. It also has a little door, so smaller animals can pass through. The pet door is great if you have a cat that you want to have full access to your home. If you’ve got a larger cat and are worried about your cat making it through the small door, no worries. Your cat can most likely jump over the top of this gate. The gate is made of metal and is very sturdy. It is easy for humans to open the latch and step through. This tall dog gate is made of steel and has a swinging door for you to walk through instead of having to step over. The latch for the swinging door is easy to use but difficult for dogs to unlatch, unless they are escape artists. The gate expands from 29″ to 34″ but comes with a 6″ extension panel, giving it the ability to expand to 40″ wide. This outdoor dog gate is made of aluminum which is lighter than steel and also weatherproof. It is meant to be used outdoors but can also be used inside. It comes in a brown color making it perfect for decks and patios since it blends in well with wood. There are two optional width extensions available for an additional cost. This owner had the gate latched but not locked, and their pup was able to open it. It’s kind of funny to watch! Heads up though, turn your volume down some before playing this video! This Pomchi (Pomeranian Chihuahua) has some volume to its bark! 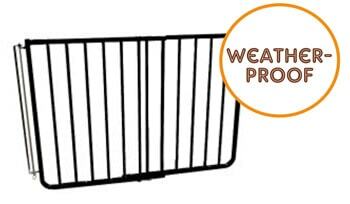 Pet gates can also be used to keep your kids out of dangerous rooms like bathrooms or kitchens. Some parents use gates to allow their smaller pets to pass through the small doors but keep their children in more confined areas like the living room. If you need to confine your pet to your yard, a wireless dog fence is a good option to consider. However, this won’t keep your kids in the yard. 😉 Just be careful, no matter how you use these gates. We suggest that you never leave your children or pets unaccompanied. What is your biggest concern in choosing a dog gate? The information contained in this article and website is not intended nor implied to be a substitute for professional safety advice; it is provided for educational purposes only. 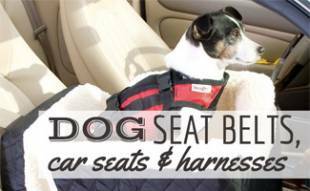 Sign up to Receive our Free Dog Guide E-Book and Monthly Newsletter! Disclaimer: This website contains reviews, opinions and information regarding products and services manufactured or provided by third parties. We are not responsible in any way for such products and services, and nothing contained here should be construed as a guarantee of the functionality, utility, safety or reliability of any product or services reviewed or discussed. Please follow the directions provided by the manufacturer or service provider when using any product or service reviewed or discussed on this website. Growing up, Kimberly used to get the sniffles when she was around dogs. Thankfully, she grew out of her allergy and is now able to play and snuggle with dogs as much as she wants! She and her husband adopted Sally, a four-year-old hound mix, in early 2017, and she has brought so much joy into their lives. Life as pet parents has been very rewarding. I got the Regalo gate because my daughter uses it for her French Bulldogs and I like it. But I have small dogs (2 chihuahuas and a yorkie) and they are actually able to slip through the bars so it doesn’t work for us unfortunately. I have the Regalo pet gate. I like it because it has the extenders for wider doorways. It’s a nice gate, enough opening on the sides for even my fattest cat to (barely) squeeze through. Problem with it, medium/large dogs will easily knock it over. Even better, if you have dogs like mine, they’ll then start to chew on the tension pieces that go into the door frame, the parts that hold the gate up. They chewed the rubber pieces off of 2 of them, making it even more useless for me……I ended up getting a resin gate for outdoors, screwing in some hinges to the side,and using that with a chain. Still have to put something in front of it though. A work in progress for me…..Darn dogs are gonna end up being outside dogs if they keep it up lol. Don’t realize how good they have it now. Nice! I was just going to ask you guys if there was an article on dog gates in the pipeline. Okay, here’s my issue: we have a front patio with a space that is greater than 6′ wide (probably 7-8′). I noticed that your “outdoor” pick offers an extension bringing the length up to 64″. Good, but just a tad short of what we’re looking for. Are there any options on the market that go even wider than this? All Content © 2019 Cover Story Media®, Inc. All Rights Reserved. Canine Journal® is a trademark of Cover Story Media®, Inc.